Finmeccanica–AgustaWestland announced today the delivery of an AW139 intermediate twin engine helicopter to the Government of Ivory Coast for passenger transport missions. The delivery marks the first AW139 to enter service in the Ivory Coast, adding one more operator to the long list of African customers and nations who have chosen and introduced the type into service. 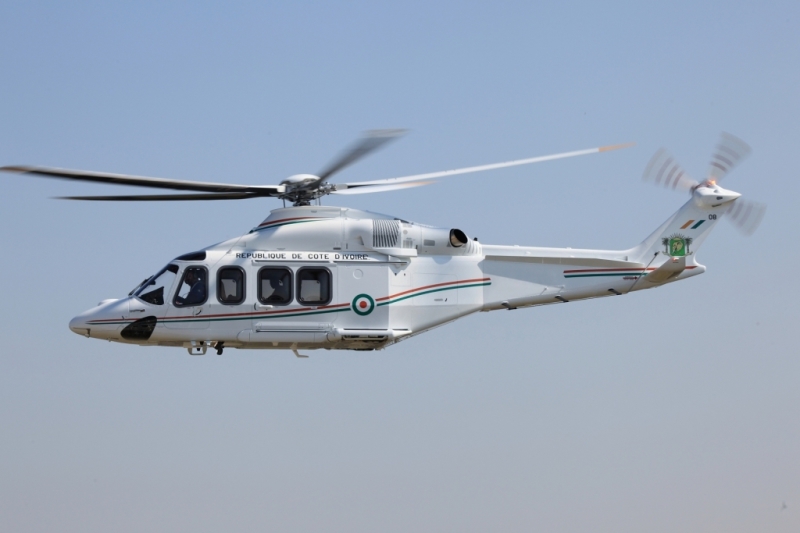 Several recent sales of AW139s in French speaking West African nations have brought the total number of aircraft sold across Africa to over 60, making it the best-selling helicopter in its class. The growing fleet of AgustaWestland helicopters in this region will be soon supported by a newly appointed Authorized Service Centre. This will soon bring AgustaWestland services closer to the customer’s operations so they can benefit from easier access to maintenance services and spare parts. The AW139 is the outright market leader in the intermediate weight class due to its unrivalled performance and safety. Additionally its class leading cabin space and high levels of comfort have made it the obvious choice to meet the transport needs of many heads of state and governments. Low levels of noise and vibration combined with a wide range of executive interior layouts make it the ideal helicopter for passenger transport missions. To date, orders for almost 900 AW139 helicopters have been placed by over 220 customers from almost 70 countries to carry out a wide range of missions including offshore transport, law enforcement and homeland security duties, EMS/SAR, utility, firefighting, executive/private transport, and other government roles. The AW139 benefits from a range of modern, constantly enhanced and tailored support and training solutions, designed to deliver outstanding mission effectiveness and safety standards whatever the mission, leveraging on the expanding network of AgustaWestland authorised service and training centres worldwide.